Welcome to EVE: Valkyrie – Warzone launch week! It's the week you've all been waiting for. 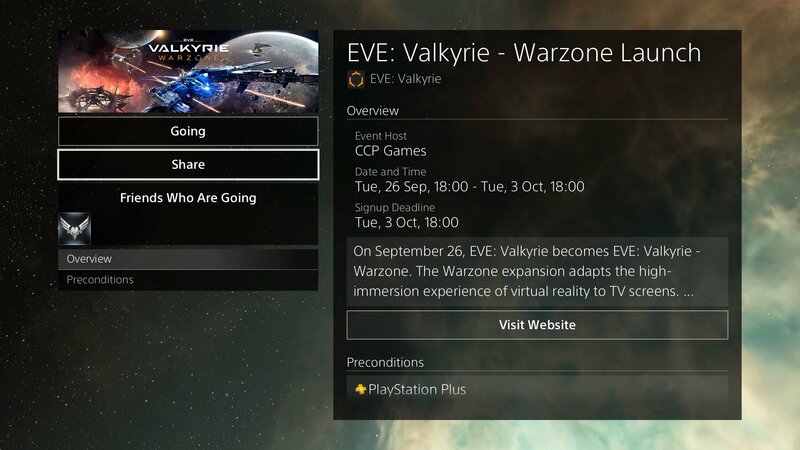 Today at CCP Newcastle someone will be pressing the magic button to send out our biggest and most important expansion since launch, and on 26 September EVE: Valkyrie will be upgraded to become EVE: Valkyrie – Warzone. 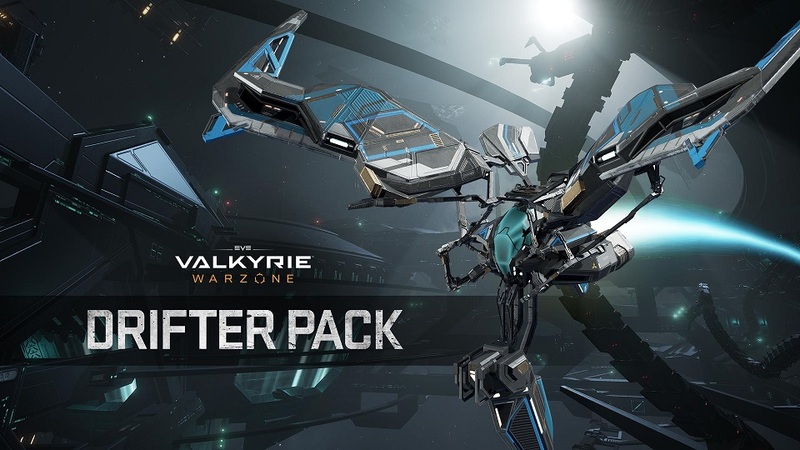 It's free to all current EVE: Valkyrie pilots – you'll receive the expansion as a mandatory upgrade on release day – and it's absolutely packed with new ships, maps and features, the biggest of which is the fact that Warzone's no longer VR-only. It's now a cross-reality game in which pilots can go into battle both in VR and on flatscreen, and all fly, fight and die together in the world's most intense and exhilarating space dogfighting extravagana. Want the full scoop? Head this way. Naturally we're very excited, as we're sure you are too, and to mark Warzone's launch we have a whole load of amazing stuff lined up for you this week to make the event even more special. Here's what's coming up. Yes, we know you're gagging to head for the Warzone and clamber into a shiny new cockpit, but cool your jets a second. With Warzone now playable on flatscreens, now's your chance to get all your friends without VR gear to join in the fun. To make things easy for you, we've prepared a stunning launch trailer showcasing all the thrills that Warzone has to offer; take a look and then share the heck out of it! EVE: Valkyrie – Warzone comes with a whole new fleet of ships to get to grips with. Most of them should feel reasonably familiar to you, but we've also introduced a whole new class that's going to change everything, and you need to know what it's about. So be sure to familiarize yourself with the sneaky new Covert class with this helpful video guide, and if you need a refresher on the other ships, we also have guides for the Assault, Heavy and Support classes; check them out for an instant advantage! We understand that a lot of you have jobs and other commitments that are going to make it tricky to devote much time to Warzone before the weekend, but don't worry because we've lined up a plan to make things extra-special when you finally get to plug yourself into the game properly. From 10:00am GMT / 5:00am EST on Friday, 29 September to 10:00am GMT / 5:00am EST on Monday, 2nd October, all Valkyrie pilots – from fresh-faced newcomers on PS4 and PC through to the hardy veterans in their VR headsets – will receive Double XP from every mission they fly. So if you're frustrated at flying a desk all week, you'll be able to hit the hangar running as soon as you clock off on Friday. This weekend's Double XP aside, you know what else is great about weekends? Wormholes, that's what. We know how you love Wormhole events, where the rules get changed around to provide a unique new twist on EVE: Valkyrie's space combat experience, and we'll be carrying on with the fun in Warzone. You'll find the best of the pre-Warzone mods - such as single ship-type modes, rainbow trails, friendly fire, super-boost, and even more mines - in the mix, as well as a whole load of new modes, upgrades and modifiers. 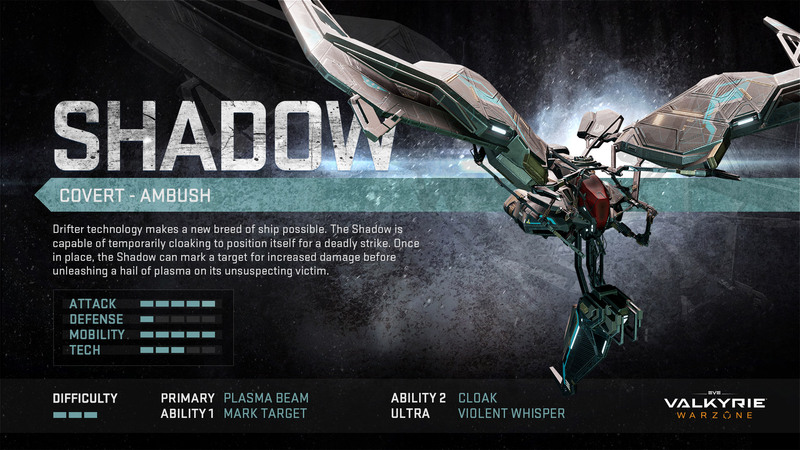 We've dropped some of the less exciting modifiers, and even incorporated some old Wormhole features into the regular game – check out the Wraith Mk6's new Ultra ability! 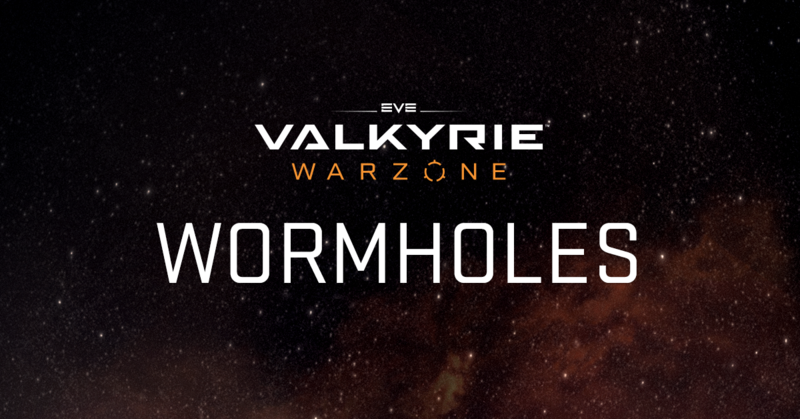 Best of all, we've created two brand new Wormholes especially for the first few weeks of Warzone, designed to introduce you to some of the new features; keep your eyes peeled for more information from CCP Badhorse later in the week. Got a question about Warzone? 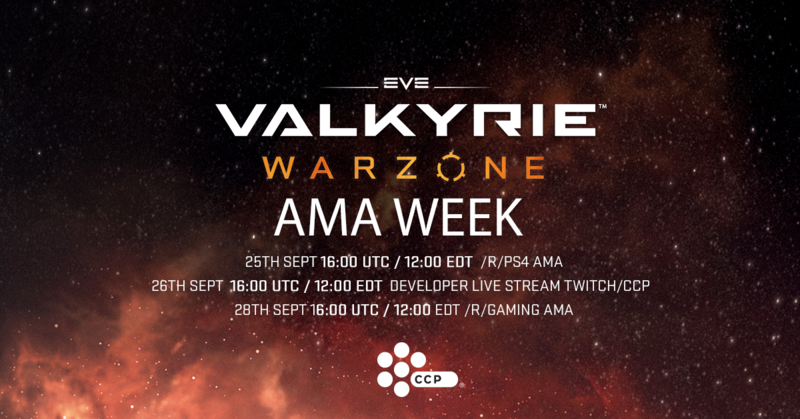 As always the dev team is around to answer your questions and chat about Warzone in the forums, and for launch week we're hooking you up with two AMAs on Reddit as well as a developer livestream. You'll be able to find associate producer CCP Bosun and CCP Roo in /r/PS4 on 25 September and lead designer Andrew Willans (CCP Roo) in /r/gaming on 28 September, plus you can catch our livestream, direct from CCP Newcastle, on 26 September with CCP Redcape. In true EVE: Valkyrie community spirit, Lead Game Designer CCP Roo will also be jumping on a stream with legendary streamer Salsa Ketchup at 2GMT on Friday for some Warzone shennanigans. Sore thumbs? Stuck at work? Still jonesing for a taste of Warzone? We've got you covered. We'll be hosting awesome community streams all week on the CCP Twitch channel and over at plus10gaming. Hit both sites for details, then tune in, win prizes, pick up some useful tips and have fun! Please accept preferences cookies to load this content. 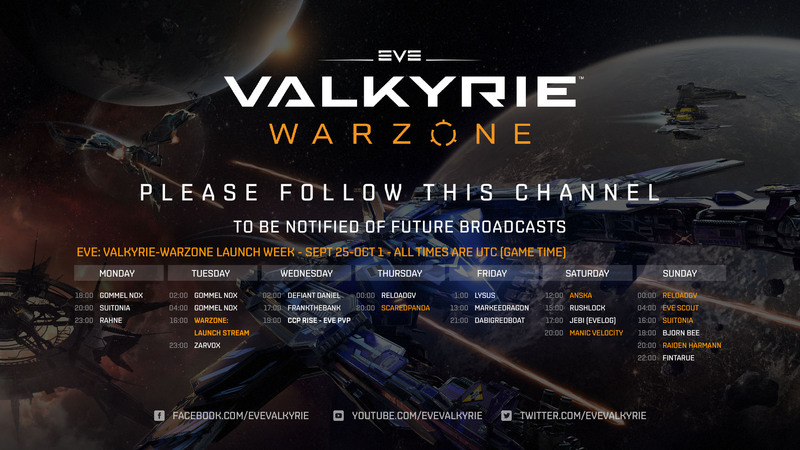 All week you'll be seeing streams from some of the EVE Universe most famous streaming personalities like Reload and Manic Velocity, and including our very own Anska and Ms Moses who will be streaming on the CCP channel at 12 UTC on Saturday, taking pilots through the first incredible EVE: Valkyrie - Warzone Wormhole. If you're playing Warzone on PSVR or PS4, don't forget to check out our live event on PSN this week; it'll tell you everything you need to know and a lot more besides! And finally, the all-important facts about how to get your hands on EVE: Valkyrie – Warzone if for some reason you don't already have a copy of EVE: Valkyrie. New pilots can buy it on or after 26 September, 2017, in the PlayStation Store and on Steam at a suggested retail price of $29.99. Complete EVE: Valkyrie base game, including all 5 previous free updates: Carrier Assault, Joint Strike, Gatecrash, Wormholes, and Groundrush. All new Warzone expansion, which adapts the high-immersion experience of virtual reality to your TV screen and introduces new maps, modes, and ships. EVE: Valkyrie - Warzone Drifter Pack with exclusive Dynamic Theme, Drifter 'Pulse' Shadow Ship Paint Job, Drifter 'Voltaic' Pilot Suit, Drifter 'Voltaic' Pilot Helmet along with 5 Gold Capsules, and 14 forum avatars. Enough of our yakking! We'll see you in the Warzone; until then, fly safe!